Professor Yongheng Deng is a Provost's Chair Professor of Real Estate and Finance, and the Head of Department of Real Estate at the National University of Singapore. 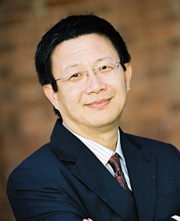 He is also Director of the NUS Institute of Real Estate Studies (A Universitywide Research Institute at NUS). Professor Deng has chaired the World Economic Forum's Global Agenda Council on Real Estate, and also served as a Vice Chair of the World Economic Forum's Global Agenda Council on Financing and Capital, Co-Chair of UN Sustainable Development Solutions Network (UN SDSN), Singapore Chapter. He has served as the 50th President of the American Real Estate and Urban Economics Association (AREUEA), the first Asian to be elected President in the Association’s 50-year history.